Did you know that Seminole Wild Card Members are eligible for all promotions? Not a member? Next time you’re here, head to any Player’s Club and sign up in under five minutes! It’s fast, easy and FREE! We’ve got the ultimate promotions line up to unleash your inner icon. Plan out your time at Seminole Hard Rock Tampa with our May Set List. Friday, May 5 – noon to 3 p.m.
Fifty four winners will receive a bottle of Don Julio® Blanco Tequila. One winner will receive a bottle of Don Julio® Blanco Tequila and a trip for two to the Hard Rock Hotel Riviera Maya. Saturday, May 6 – noon to 6 p.m.; 7 p.m. Hourly drawings are scheduled between noon and 6 p.m. with one additional drawing at 7 p.m. Win cash or Free Play. Tuesday, May 9 & Wednesday, May 10 – noon to 7 p.m.
One winner of $1,500 Free Play every 15 minutes. 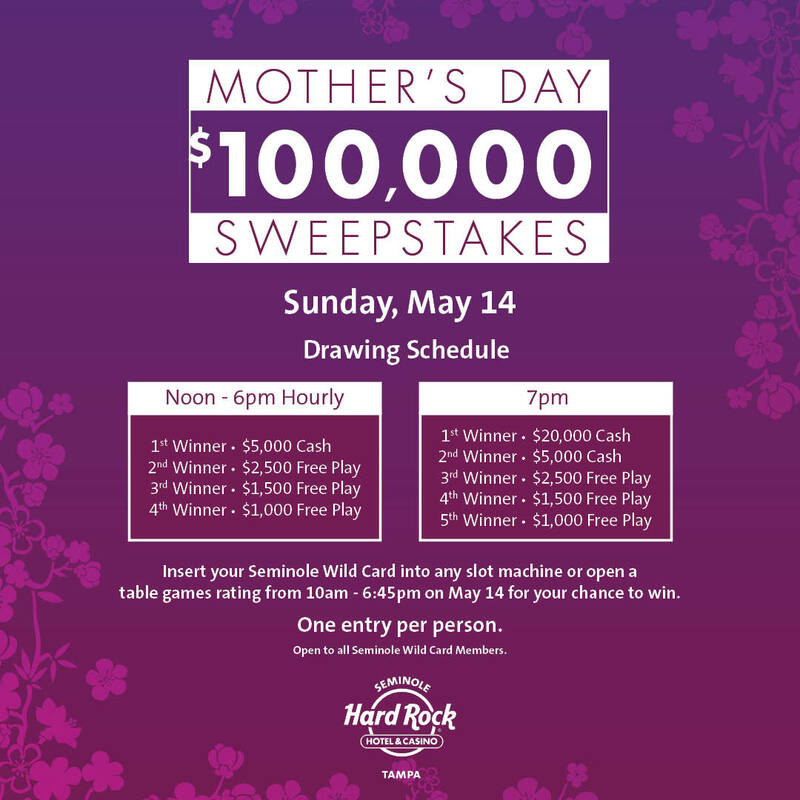 Sunday, May 14 – noon to 6 p.m.; 7 p.m.
Tuesday, May 16 & Wednesday, May 17 – noon to 7 p.m.
One winner of $777 Free Play every seven minutes. Wednesday, May 31 – 5 p.m. to 9 p.m.
Jackpot winners in April will receive one entry for every jackpot of $1,200 or higher won in the month of April. Free Play will be awarded during drawings at 5 p.m., 6 p.m., 7 p.m. and 8 p.m. There will be one winner of $10,000 cash during the 9 p.m. drawing. Do better than flowers and join us on Mother’s Day to treat mom to a delicious meal or spa service! Did somebody say tequila! The party is in Hard Rock Cafe on Cinco De Mayo, choose any three flavors of tequila and enjoy a Margarita Flight!